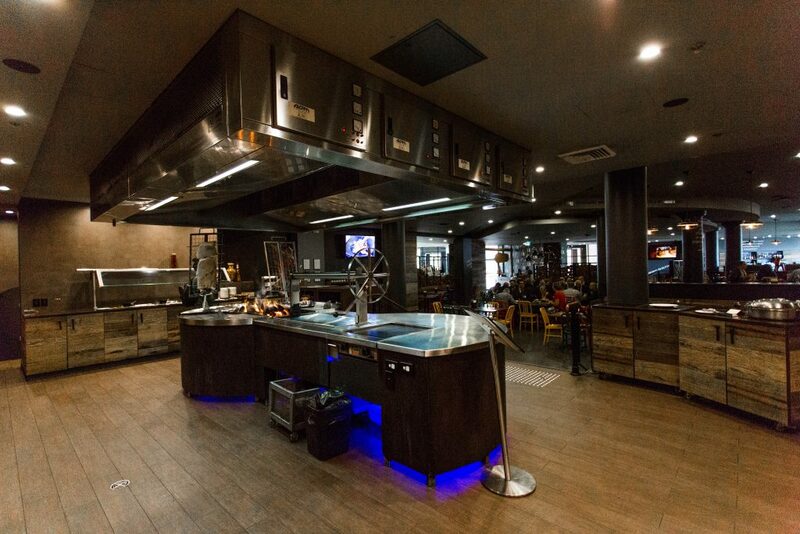 Argentinian Grill located in the Stamford Plaza hotels, with discharges generally situated at low levels (hotel podium levels) and solid fuel appliances (Type 5 cooking) with high smoke and grease exhaust. 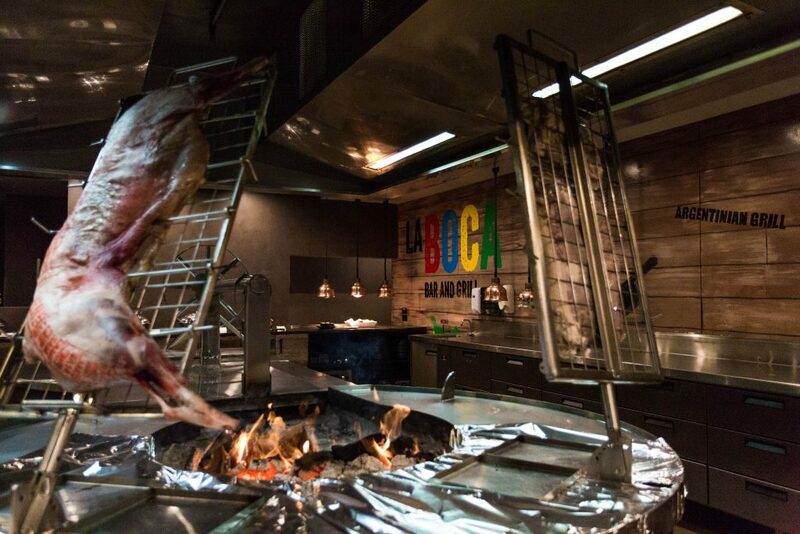 La Boca Bar and Grill is an Argentinian Restaurant chain located in the Stamford Plaza Hotels. 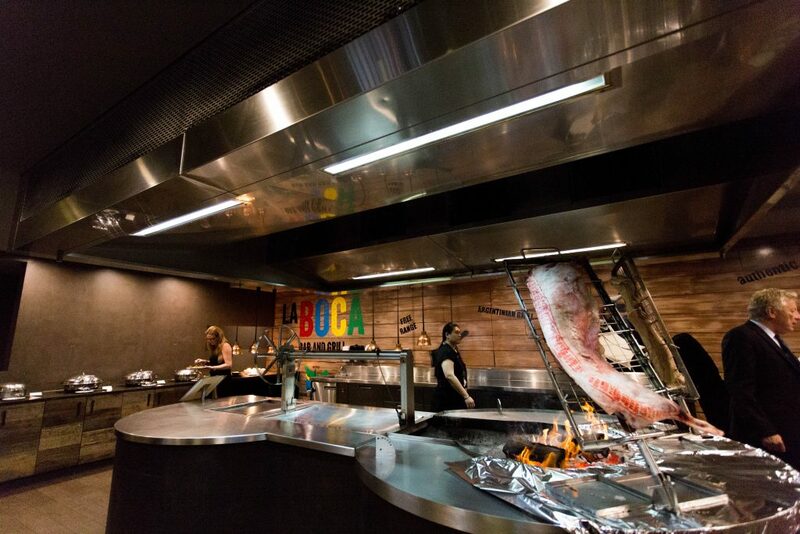 La Boca uses solid fuel fire pits and char grilling to prepare it’s signature meat dishes. 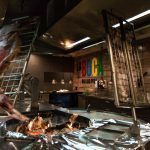 The solid fuel cooking line is located within the front of house and is a core attribute to the restaurant’s design and atmosphere. The open fire pit produces a high heat and highly concentrated exhaust with the addition of live sparks and embers. From a kitchen exhaust perspective, the project is very challenging. Firstly, containing and successfully capturing the exhaust smoke in a front of house cooking line with meat grilling and solid fuel demands. Secondly, the exhaust and filtration equipment is subject to high temperatures for long periods at a time. And finally, the filtration equipment is required to filter smoke particles, grease from the meat as well as live embers and sparks from the fire pit. The filtration needs to ensure that no visible smoke is discharged at the Hotel podium levels. 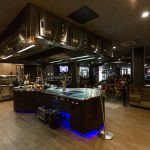 The AOM supplied kitchen exhaust hoods have been able to meet all these challenges. The kitchen exhaust hoods have been equipped with double pass high efficiency electrostatic precipitators. 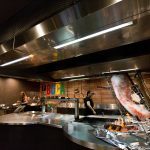 Optimal use of low velocity make up air ensures that all kitchen exhaust is contained within the hood structure and ultimately filtered within the canopy structure. AOM supports the Stamford Plaza maintenance team with weekly site visits and inspections of the hood and filtration equipment. This guarantees that the hoods are performing to their expected standards and provides our Client with additional peace of mind.